I am a former pole vaulter at Brigham Young University. In 1971 I set the Utah High School state record in the pole vault. 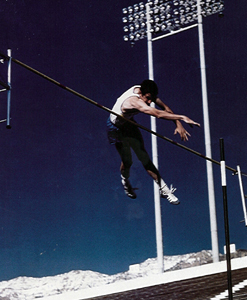 In 1977, after serving a mission and gradually getting better and better at pole vaulting, I set a new BYU school record of 17 feet 9 inches. I went on to win the indoor and outdoor WAC Championships that same year. In January of 1977, I was accepted into dental school at Georgetown University’s School of Dentistry. I knew that this is what my Heavenly Father wanted me to do with my life. I knew because I had prayed about it and felt the peace in my mind and heart that this is what I should do. I have had many experiences throughout my life that have given me confidence that my prayers are answered. Once when I was eleven I got lost in the high Uinta’s (a secluded mountain range in north eastern Utah). After looking around and trying to find my group I was with, I concluded that all I could think to do was pray. I knelt down under a small pine tree and poured out my heart to the only being that could help me. I had been crying but after praying I felt confident that I would be lead. I started running the opposite way I had been going. As a group we had left the trail earlier, making a beeline to a campsite. As I ran I came upon a trail. I ran along that trail and watched it split three times. It was as if I knew where I was going but I had never been there before. I soon ran into camp where they were putting up tents and trying to find the group I had been with earlier. I know prayers are answered. Soon after beginning dental school I received a letter inviting me to apply to train in Colorado for the 1980 Olympics. I had a decision to make. I spoke with the dental school Dean, he said he would let me off for two years to train and then let me back in. My wife and I spoke to many people to get their feelings. Most said we ought to go for it. Our parents were a little hesitant. We fasted and prayed to know the Lord’s will. We felt, after praying, we should not drop out of school. I didn’t drop out and then two years later the USA boycotted the 1980 Olympics. Once again, the Lord heard and answered my prayers when I could not see the way. I know that God loves us and is interested in our growth and development. He will lead us along as long as we continue to follow by taking action. I know that he teaches us through living prophets today just as he did in times past. I know that the Book of Mormon really is an ancient record written by prophets for our day. I also know that anyone can find out that it is true by reading the book and praying intently for knowledge from God. This entry was posted in Testimonies on April 14, 2010 by rkm.